How many arms does the Milky Way galaxy have and how is it determined? This is actually a really, really tough question. Purple: Norma Arm and Outer Arm. 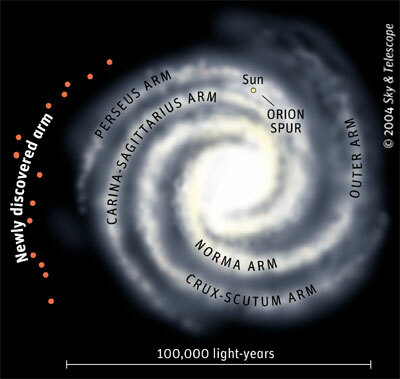 This arm has one end at the center of the Milky Way; this end is called the Norma Arm. It's actually quite small. However, as you continue outward along the lanes of gas, dust and stars, the Norma Arm becomes the - wait for it - Outer Arm. This arm also emanates from the center (well, duh!) and is distinguished by large numbers of clusters of red supergiants near the center (where it is referred to as the Scutum Arm) of the Milky Way. The Scutum-Sagittarius Arm is one of the Milky Way's two major arms. The defining feature of this arm is that is has many H II regions, where ionized gas is plentiful. It is though that stars can form there. However, H II regions are also present in many other parts of the galaxy. Observations from the Spitzer Space Telescope seem to support these theories and prior observations. The Spitzer results are, I think, very important for understanding our galaxy and the things in it. It confirmed the existence of all four arms, but also confirmed that the Norma-Outer Arm and Sagittarius Arm are relatively minor compared to the other two. The Near and Far 3 kpc Arms (which really are just one arm) are very close to the galactic center - about 3,000 parsecs (hence the name). The Far Arm was only discovered recently, while the Near Arm was first observed about 50 years ago. These two mini-arms are expanding outward at an enormous rate. The combined 3 kpc Arm then becomes the Perseus Arm, which extends out to about 3.5 times the distance from the center of the 3 kpc Arm. It is the other major spiral arm of the Milky Way. Okay, so that's simple enough. 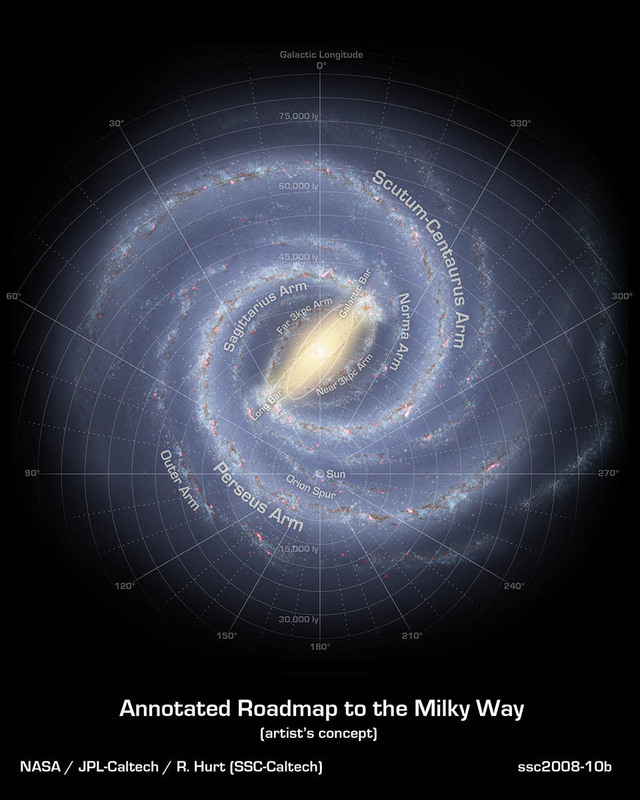 The Milky Way has four spiral arms, right? Well . . . sort of. The discovery of the "New Outer Arm"1 shook things up, because that would mean that the Norma-Outer Arm reaches nearly all the way around the Milky Way. That's strange and borderline inexplicable. Well, not really. But it's very interesting. By the way, someone at one point wondered, "Which are we in?" That, too, doesn't have a simple answer. Current observations state that we're in the Orion-Cygnus Arm, a/the midget of the galaxy (depending on whether or not there are other "mini-arms"). It's tiny - 1.1 kpc wide and 10 kpc long - and is between the Carina-Sagittarius Arm and the Perseus Arm. NASA gives a good explanation of it here. The other group of scientists referred to here used the Very Long Baseline Array to image the Milky Way with radio waves; their observations support the four-main arms model. So at the moment, I think the answer is four, though two arms are more distinct that the other two. 1Dammit, paywall! Thank goodness for arXiv. How does the Milky Way look like above 66° North and below 66° South? How much overlap will the Andromeda galaxy and the Milky Way have when they collide? Have parameters been determined for the Fourier components of a Milky Way spiral density-potential model? In which direction does the Milky Way rotate?